His Eminence Archbishop Moushegh Mardirossian, baptismal name Sarkis, was born in Beirut, Lebanon. After graduating from Noubarian Armenian Elementary School in October 1969 he was admitted into the Seminary of the Catholicosate of the Great House of Cilicia in Antelias, Lebanon. Upon graduation from the clerical college (“Jarankavoratz” section) of the Seminary in June 1974, he was ordained “deacon” by H.E. Archbishop Ardavazt Terterian. In May 1976, His Eminence graduated from the “Endzayaran” class of the Seminary and was ordained “Apegha” by H.E. Archbishop Ghevont Chebeyan. As a member of the Cilician Brotherhood, he served in the Catholicosate as vice-sacristan/sexton and private secretary of H.H. Catholicos Khoren I of blessed memory, and later of H.H. Catholicos Karekin II of blessed memory (later reigning as Catholicos of all Armenians) in the chancery. At the Seminary he also served as a member of the administration and teacher at Mardigian Armenian School (currently the Yeghishe Manougian School). In January of 1979 he was assigned to the post of pastor of the Armenian Community of Thessaloniki, Greece, where he served for three and one-half years. For his thesis on a translation and critical analysis of the Gospel of John as related by Yeghishe the historian, he was awarded the doctorate of the Armenian Church(“Vartabed”) in December of 1979. During his pastorate he attended classes in Greek language and philosophy at the Aristotelian University in Thessaloniki. In his quest for higher learning, he followed special courses at Haigazian College in Beirut, Lebanon. Early in 1982, he served as Assistant to the Prelate and held various pastoral and administrative positions in the Western Prelacy of the United States of America, which included his pastoral service at St. Garabed Armenian Church, the Mother Church of the Prelacy. In recognition and appreciation of his meritorious services, in 1987 he was elevated to the rank of “Father Superior”, by the then Prelate H.E. Archbishop Datev Sarkissian. He was later assigned to the post of Dean of Forty Martyrs Armenian Apostolic Church in Orange County, where he contributed to the advancement of the church and community life. From 1991, he served as Vicar General of the Prelacy for four years. For two years, he attended special courses for his Master’s Degree at Fuller Theological Seminary. On November 17, 1995, the Joint Session of the Prelacy Religious and Executive Councils unanimously elected the then Right Rev. Moushegh Mardirossian as Locum Tenens of the Prelacy. Following his election, he simultaneously performed his twin posts of Locum Tenens and Dean of Forty Martyrs Armenian Apostolic Church in Orange County. In May of 1996, the 24th Prelacy Representatives Assembly elected Right Rev. Moushegh Mardirossian Prelate of the Western Prelacy with an absolute majority of votes. At the request of the 24th Prelacy Representatives Assembly and in recognition and appreciation of his meritorious services, His Holiness Catholicos Aram I officiated over the Episcopal ordination and consecration of Right Rev. Moushegh Mardirossian during Pontifical Divine Liturgy on Sunday, June 22, 1997, at St. Gregory the Illuminator Cathedral in Antelias, Lebanon. 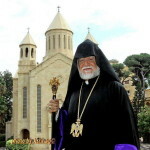 Five years later, His Holiness Aram I Catholicos of the Great House of Cilicia elevated His Grace to the rank of Archbishop by an encyclical dated 28 May 2003, thus honoring his services and devotion to the Armenian Apostolic Church and the Armenian Community. 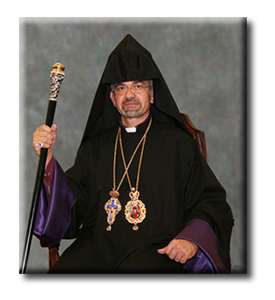 In May of 2004 the 33rd Representatives Assembly of the Western Prelacy unanimously re-elected His Eminence to serve as Prelate for a third consecutive four- year term. One of the most memorable achievements of the Prelate is the realization of the long-standing dream of providing the Western Prelacy with a new headquarters to house not just the offices but also the committees and organizations functioning under the Prelacy. The current property in La Crescenta was purchased in 2003 and following preliminary renovations, the Prelacy offices relocated to the new building in February of 2004. In February of 2005, the extensive remodeling necessitated the temporary relocation of the offices to Holy Martyrs Church in Encino. During His Pontifical visit in October of 2005, H.H. Aram I, Catholicos of the Great House of Cilicia, consecrated the altar and the cross atop the dome of the Chapel, and also blessed the building. In February of 2007 the offices were relocated to the new headquarters which houses the St. Dertad and St. Ashkhen Chapel, an assembly hall, reception hall, conference rooms, bookstore, staff offices, and offices for committees serving under the Prelacy. The official opening of the Western Prelacy was held on May 6, 2007. Another remarkable achievement was the realization of a long-standing dream of providing the Pasadena parish, which had been renting a church for 17 years, with its own church. Thanks to the efforts of the Prelate and he collaboration of generous benefactors and community members, the dream came true in late 2002. The new church, named St. Sarkis, began functioning in February of 2003 and has grown to satisfy the spiritual demands of the Armenian Community in Pasadena. In time, the church was renovated to include a dome and belfry in the traditional Armenian architecture. The church was consecrated by His Holiness during his Pontifical Visit in October of 2005. Beyond these works, the Prelacy schools also received new buildings and became better institutions of learning. Ferrahian Armenian School in Encino had a new building constructed on its premises. After 25 years, the old building that was in need of dire repair was rebuilt and a new building was erected in its place. The building now serves as the Holy Martyrs Church offices. Also, in 2005 the North Hills campus had an additional renewal on its campus, which now houses the preschool. The benefactor for the project was Mrs. Ashkhen Pilavjian. Alex Pilibos High School was also blessed with two new buildings that were built during the term of the Prelate. The school now has its own gymnasium as well as its own library facilities. The architecture was a marvel on its own, built in the shape of Noah’s Ark, the library stands above the school ground. Alongside all of the building work that has occurred during his term, His Eminence has also overseen the creation of new parishes that serve and fulfill the spiritual needs of areas populated with Armenians that do not have their own permanent churches. These areas include Utah, Colorado, Nevada, Oregon and Arizona, where the Armenian populous is in need of the spiritual guidance that the church provides. Four of the more established of these parishes have been the Colorado, Crescenta Valley, Las Vegas, and Corona/Riverside County parishes which now offer Divine Liturgy regularly. During his term, the Prelate has authored two volumes of sermons and spiritual messages. 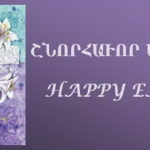 He has also overseen the publication of Armenian language and history textbooks, as well as textbooks in Eastern Armenian. A number of books by prominent authors were also published by the Prelacy. 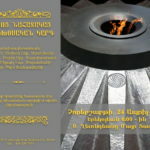 The official publication, Spiritual Spectrum, continues to grow in circulation and was enhanced to include in-depth reports of the activities of the Prelacy. The Prelate also oversaw the development of the website, which continues to expand.